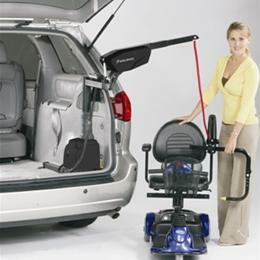 This easy to use product lifts and stores your unoccupied scooter or powerchair inside your vehicle at the touch of a button. Simply connect the docking device, push a button on the hand-held pendant, let your Curb-Sider do the heavy lifting for you! The Curb-Sider is the world's most popular vehicle lift (over 50,000 sold)!